Velvet is the word to describe the velvety textured flowers of the Daylily Hemerocallis Raspberry Suede. The large 5 inch wide flowers are a rich raspberry purple to red shade. Blooms mid-summer. The slightly ruffled edges of the Raspberry suede daylily are the perfect frame for the wee bit of chartreuse throat. The large clumps of this hemerocallis are formed by its long arching leaves. Great companion plants for the Raspberry Suede Hemerocallis are yellow flowering perennials such as Moonshine Yarrow, Coreopsis Moonbeam, Black-eyed Susans, white flowering Shasta Daisy, and other pink and yellow flowering daylilies. 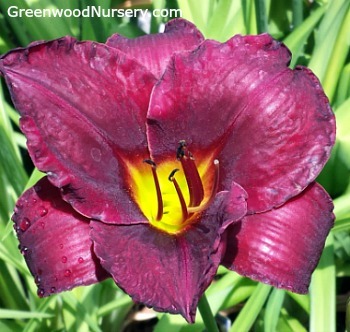 The Raspberry Suede Daylily flowers reach up to 28 inches tall with the plant spread in the 18 to 24 inch width.